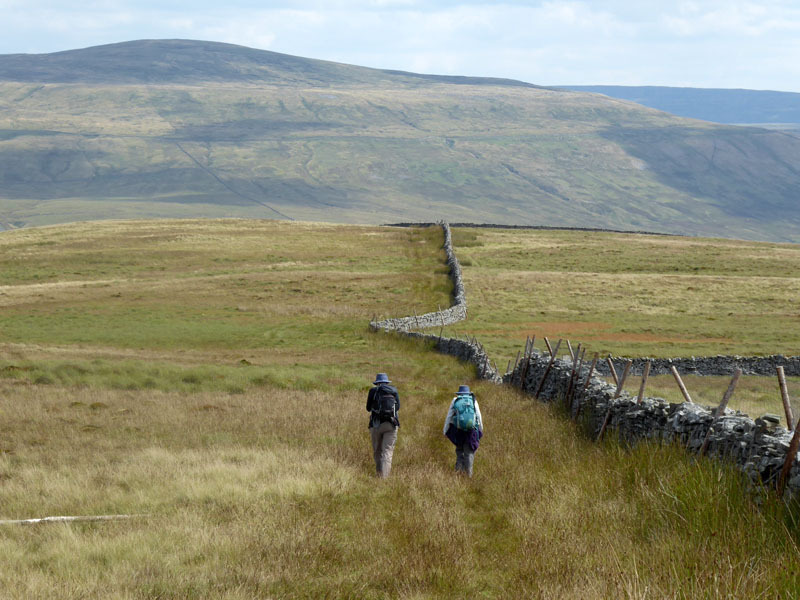 Returning to an old favourite formula of using the Settle-Carlisle Railway as a means of facilitating an otherwise remote walk. 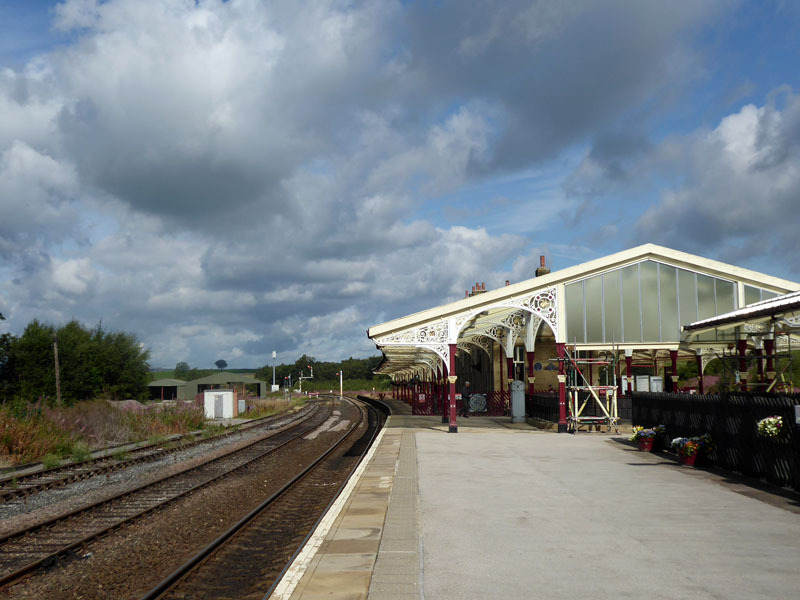 Hellifield Railway Station is the start point and it's now the 10:13hrs after many years of being the 09:39hrs. 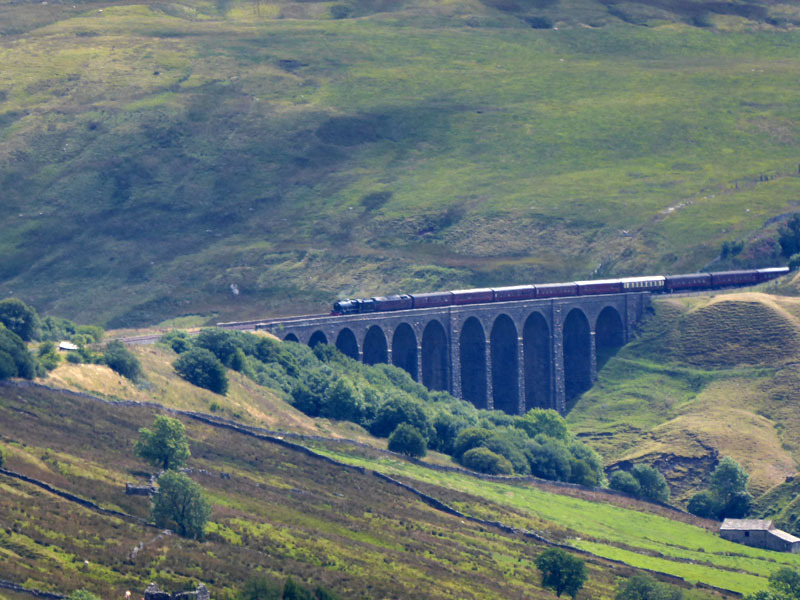 They have put on extra train, just what we always wanted...but it doesn't stop at Hellifield! It can be boarded at Skipton at around 08:26hrs. 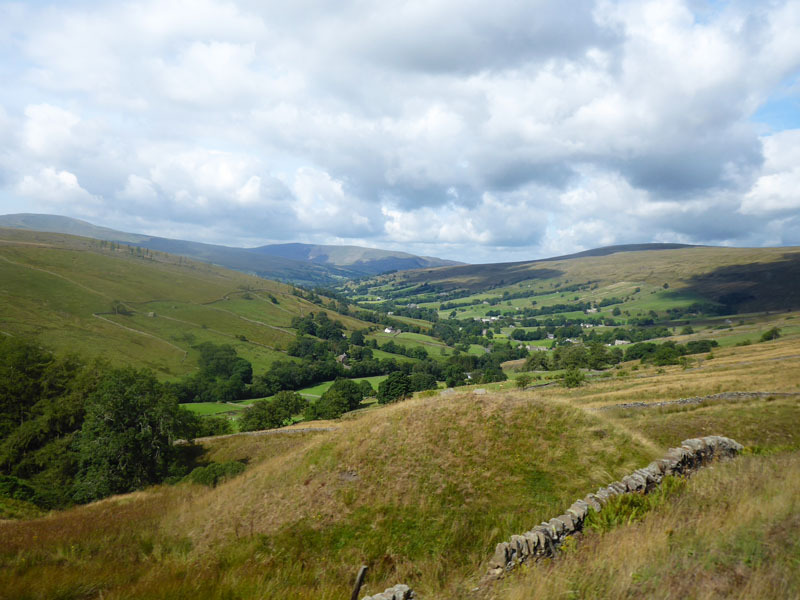 On the right is a view of Dentdale from the train, note the hump of earth, maybe a unintentional creation of the navvies way back then. 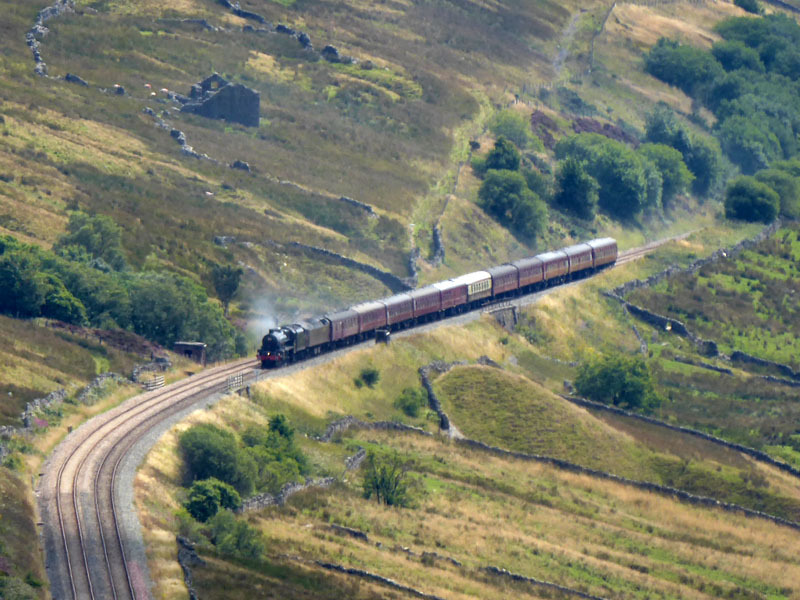 The train heads off northwards from the station. 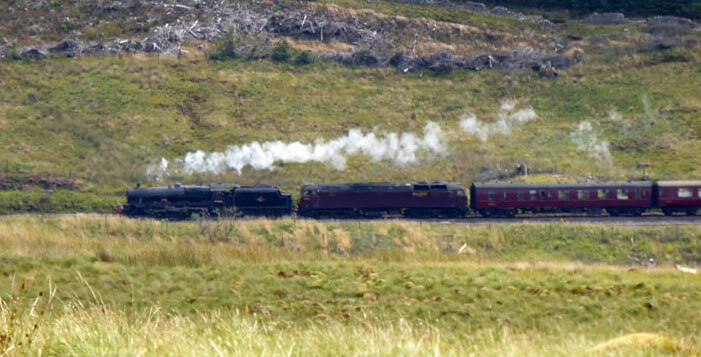 For the enthusiasts it was two single-units paired up and in South-Western colours. I'm not carrying my anorak today, so no further details are available and I'm hoping it won't rain. 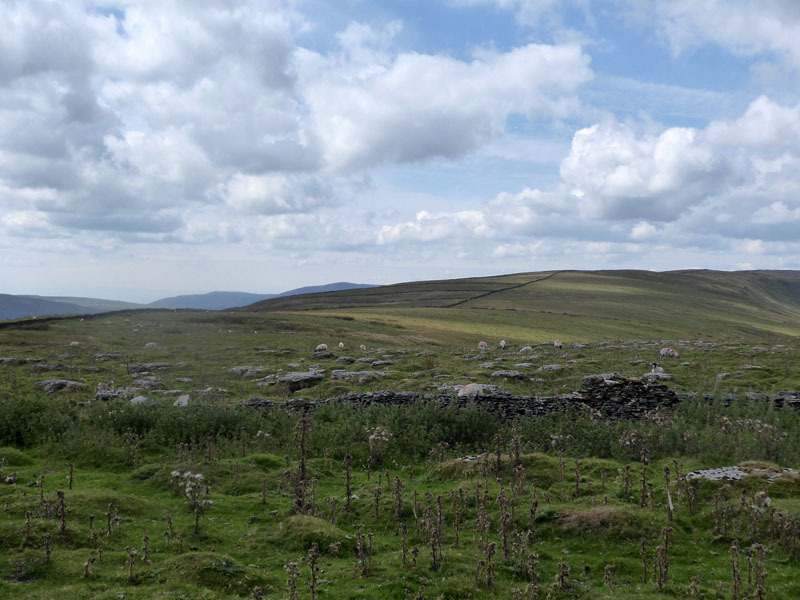 The lack of a public right of way means that walkers heading for Aye Gill Pike, or Garsdale for that matter, need to walk down the steep road from the station to the road and pick up a footpath through fields and farms to join the bridleway over to Dandra Garth (Garsdale) from Dockra Bridge in Cowgill. 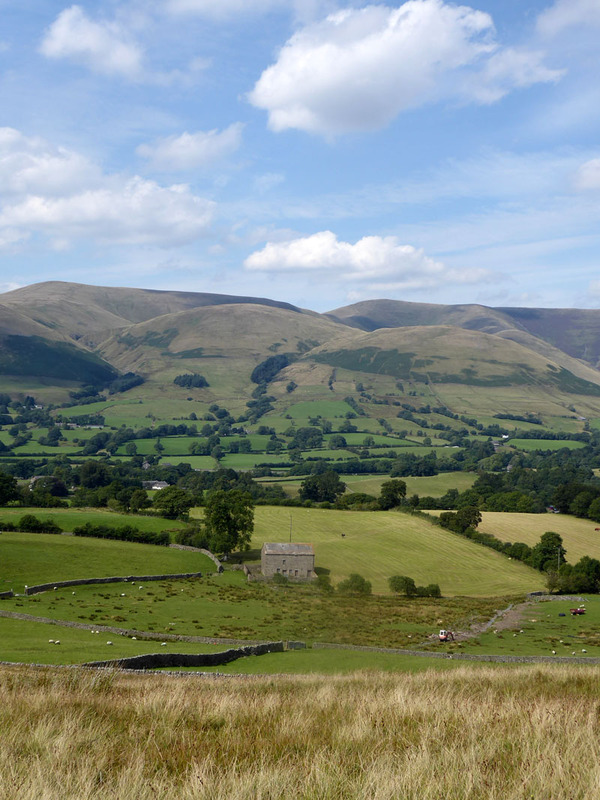 The plan is to walk as far as Sedbergh and catch the 16:50hrs Western Dales Bus back to Dent Station. The schedule leaves time to spare, so there is no rush. 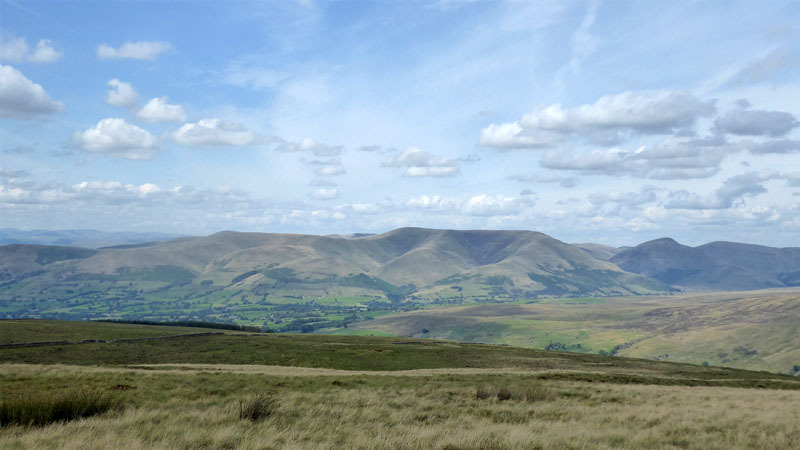 Only be reading reports from other websites was I confident of a reasonably easy walk up here and onto Aye Gill Pike. 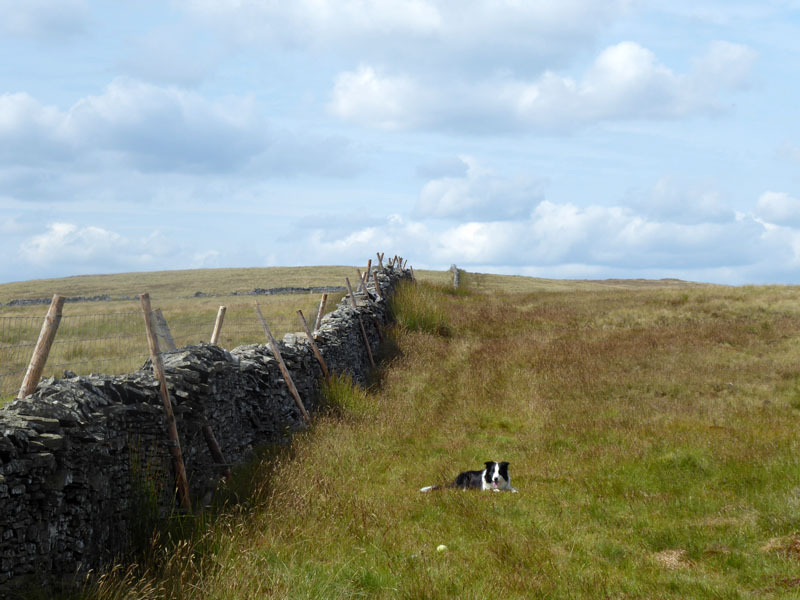 The map shows many physical boundaries which could be walls or fences and may or may not have walking gates or stiles. 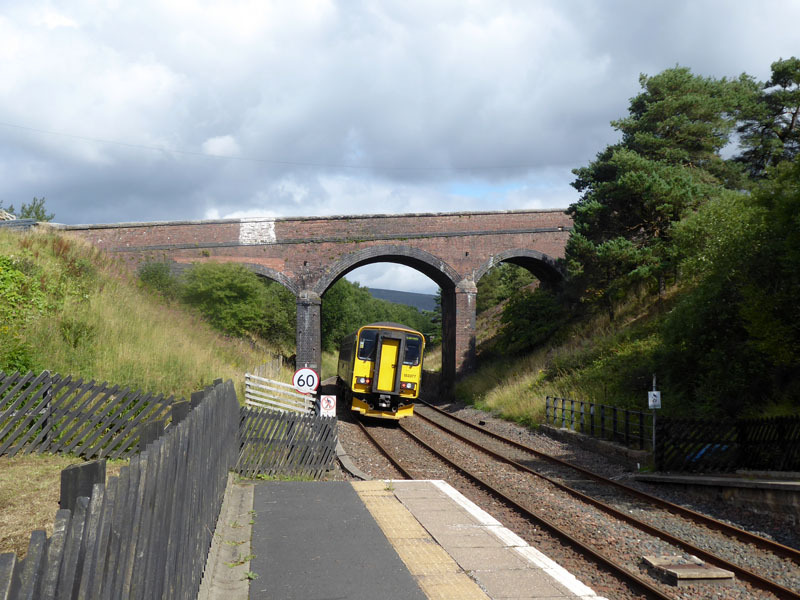 We took lunch by a wall with a great view of the railway, all the way from Dent Head Viaduct to Dent Station and a bit more as the railway heads for Risehill Tunnel. Leads "The Waverley" up the line with assitance from a Diesel Locomotive due to the present fire risk of sparks from a charging steam engine. Can you see the hump from the earlier photo? I'm about a mile and a half away from the train. How did they get on all those years ago? Maybe the fire risk was much reduced due to the fact that once burnt by the first fire of the season, the lineside vegetation would be unlikely to catch fire again. Maybe they had firemen on watch in certain places. 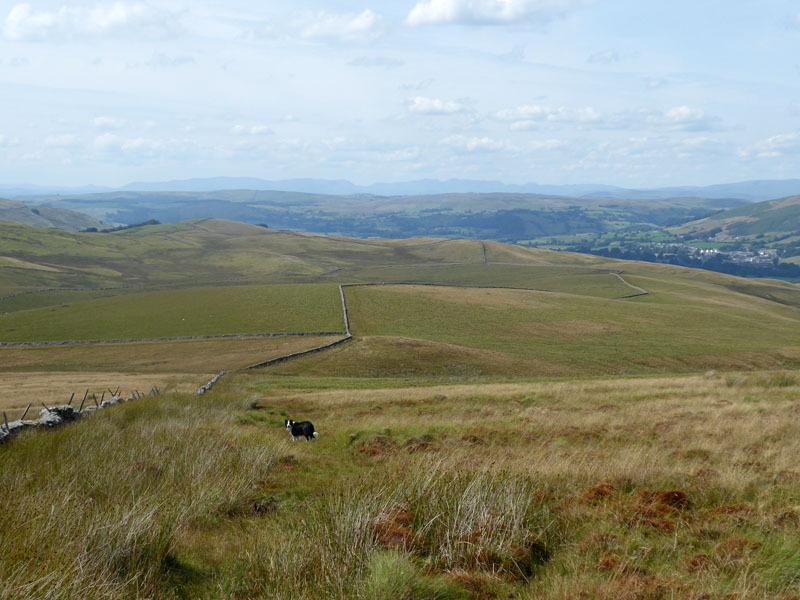 It's a rather long, rather than high, fell. 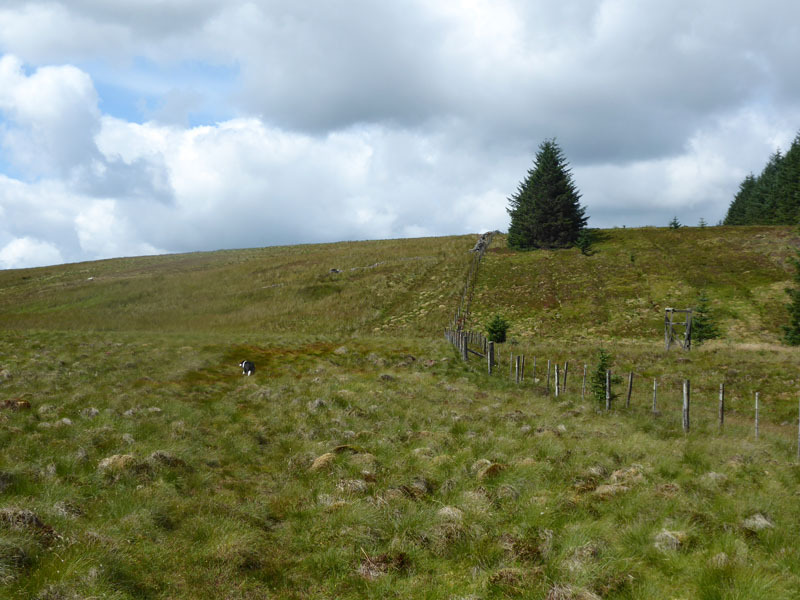 The long dry spell has drained the bogs and I can well imagine this walk could be a bit squelchy at other times. Soon and unexpectedly we passed two ladies walking the opposite way. More Jill & Jen than Bill & Ben. 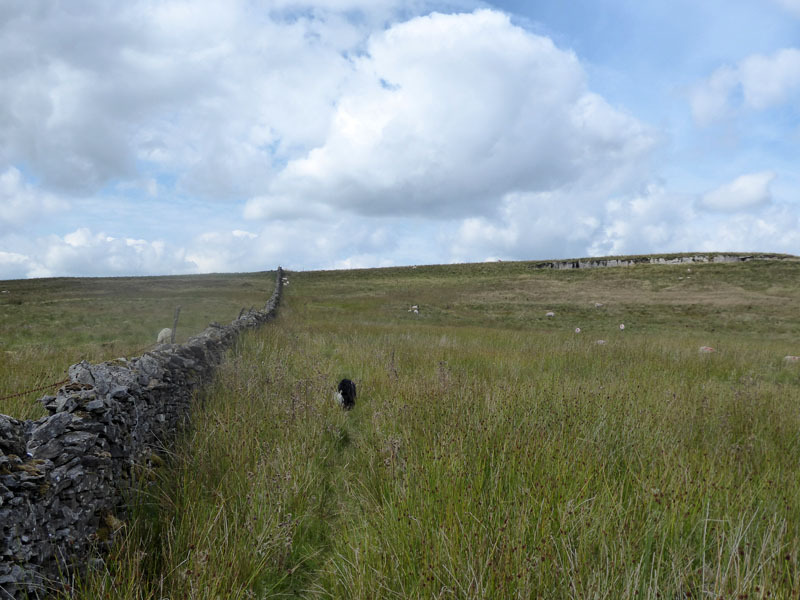 The kink in the wall is shown on the map to avoid a small tarn, but all small tarns seem to have dried up. 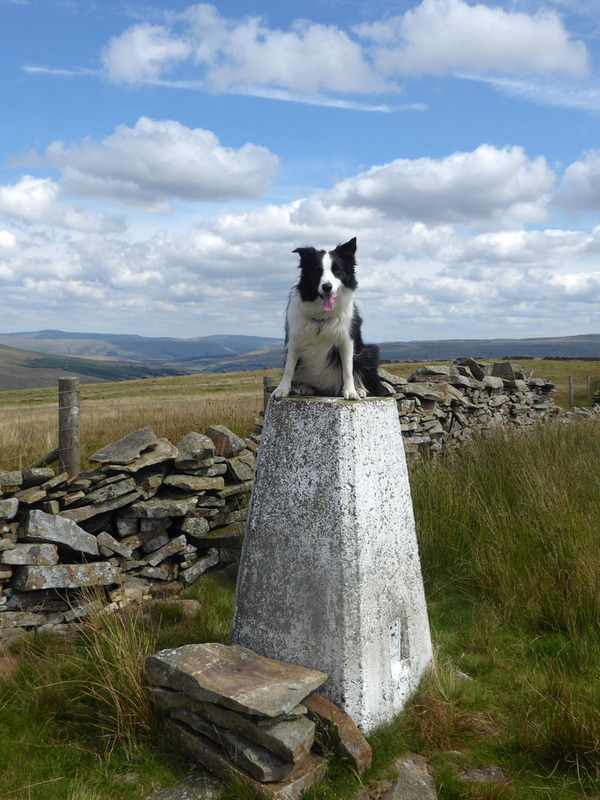 They put the trig point on the wrong side of the wall, hence twice over the stile. 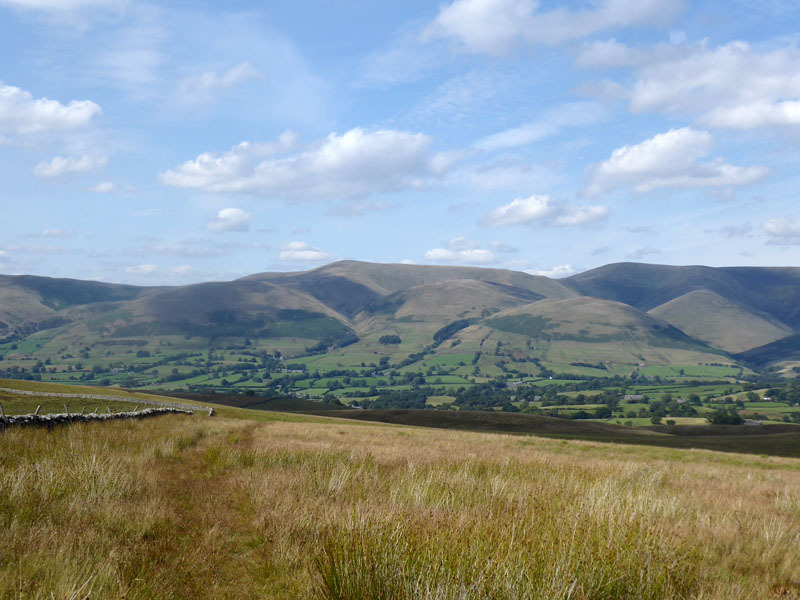 Now for the descent route to Sedbergh. 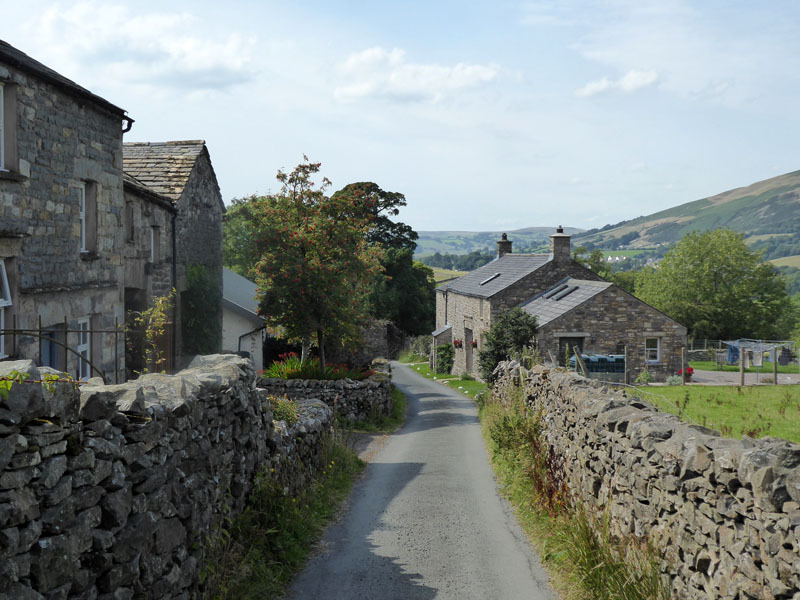 Muppet me has brought two copies of OL2 - Yorkshire Dales S&W and left OL19 Howgill Fells etc. in the car. 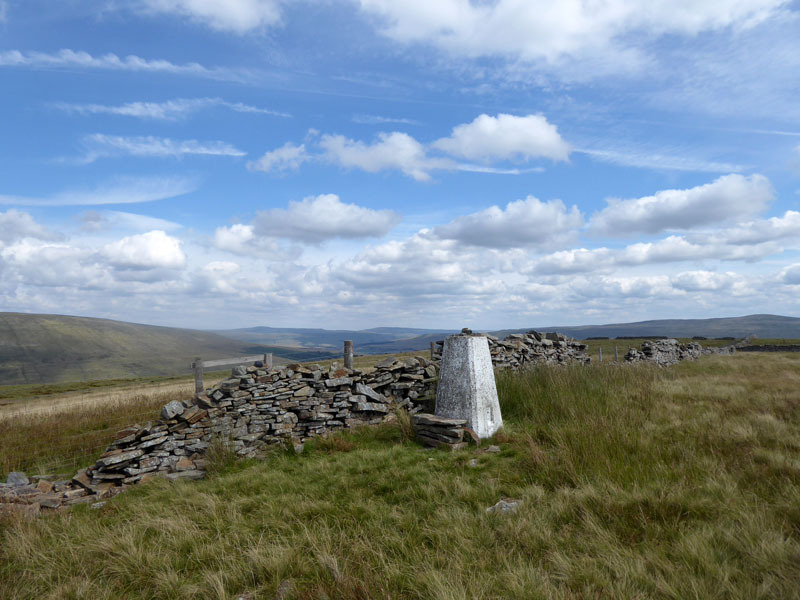 The former shows the route as far as a point where the Dales High Way joins from Dentdale. 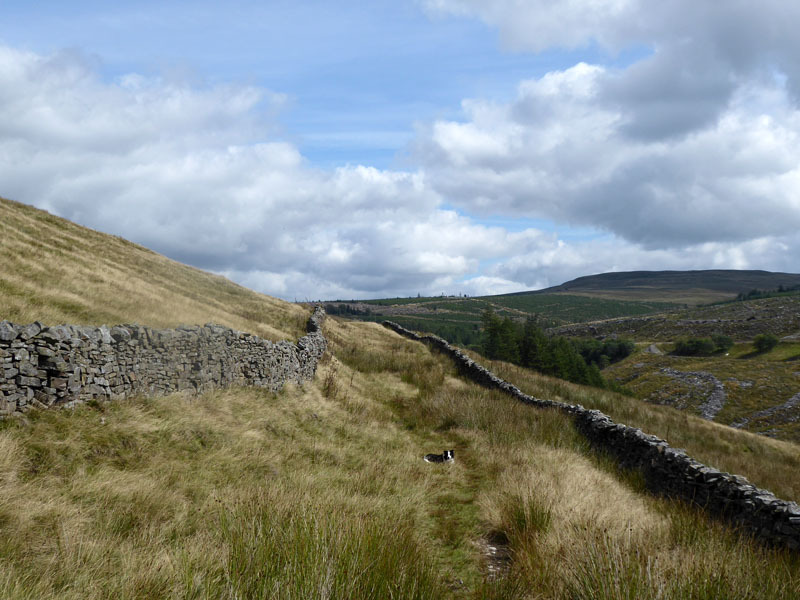 Well, it looks quite straightforward, more wall-based orienteering. 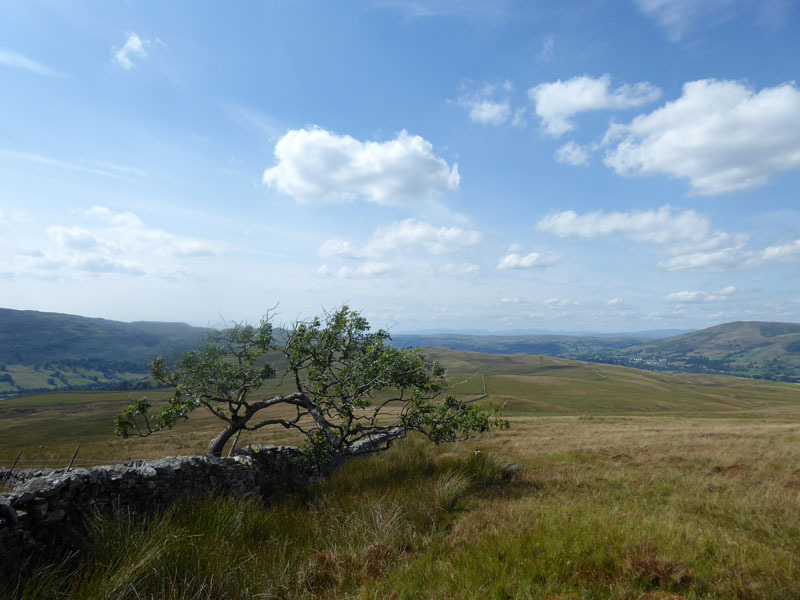 Remarkable lone tree in the middle of a huge wilderness of treeless landscapes. 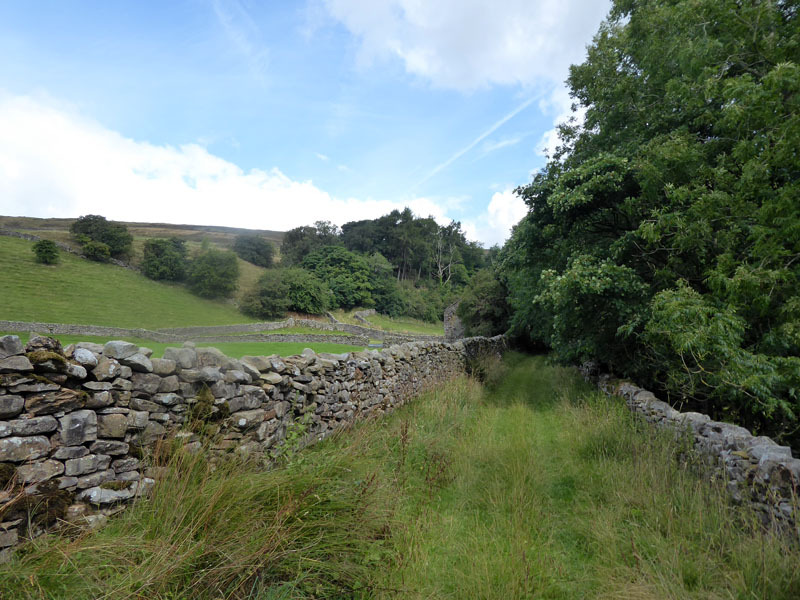 The path eventually leads away from the wall and a water opportunity occurs at Holebeck Gill. Now it feels as though we are approaching civilisation. 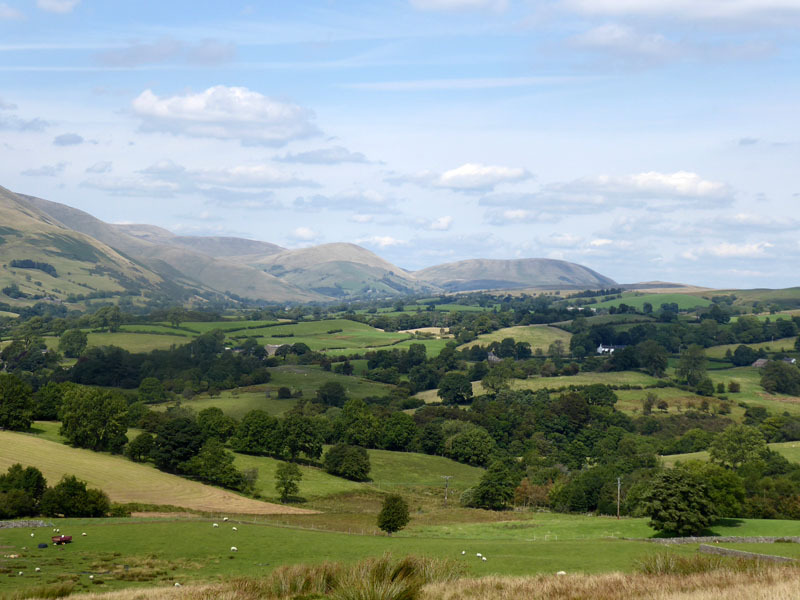 This view across the valley shows Howgill Fells, the two bumps under the horizon are Sickers Fell (left) and Knott (right). 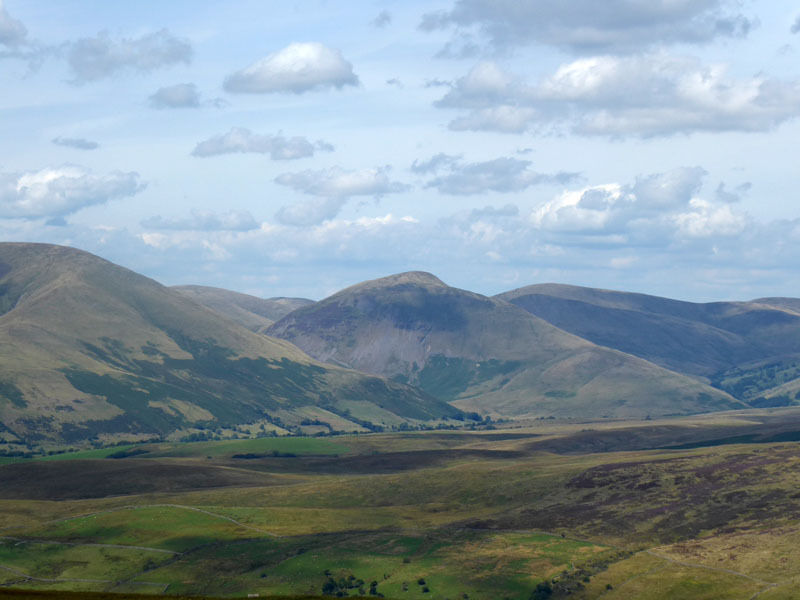 The high point to the left of the photo is Arant Haw. 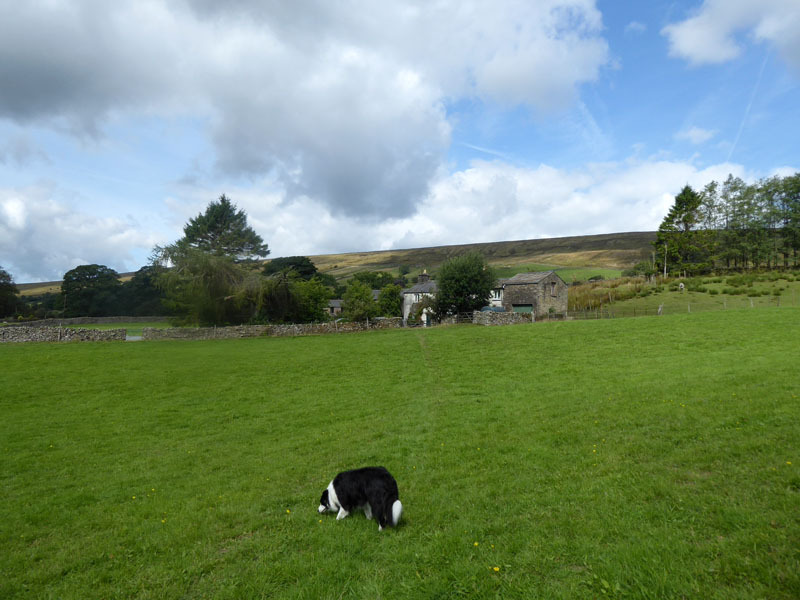 Our route went down the lane past High Hollins and Bank Cottage Farm and reached the A684 for a short roadwalk before walking along the River Rawthey after New Bridge. We were here the previous weekend and my choice of walk territory was no accident. 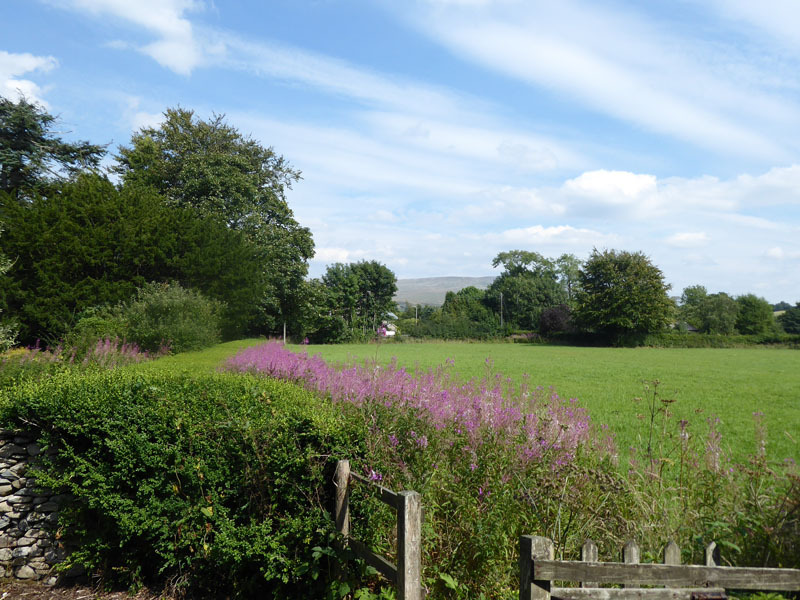 This area has so much to offer, high on the list is the quietness of the walking routes. 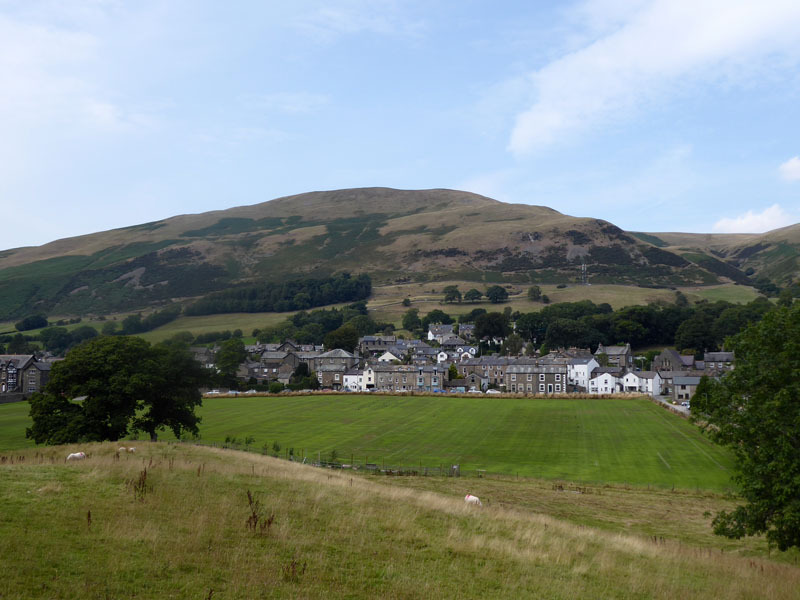 Into Sedbergh with Winder dominating the background. Bus due in 1 hour and 20 minutes, so time to find something to eat. Last week this cafe looked a bit too busy for me n'Molly, but today there is room for us. 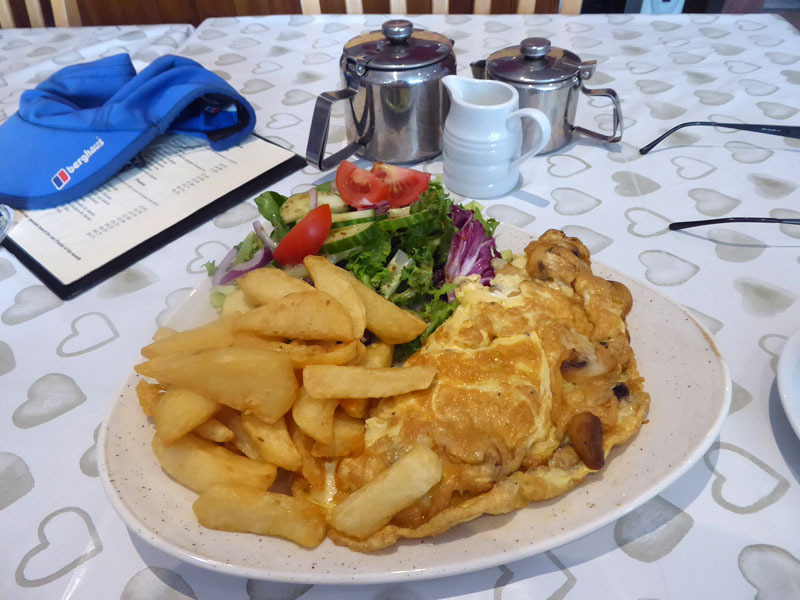 Excellent menu, customer service and food! Dogs welcome. 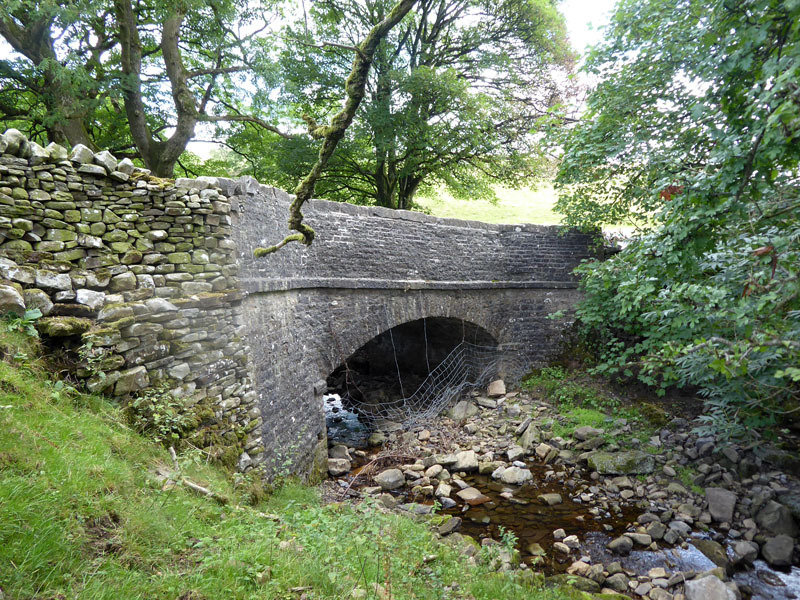 A group of eight mature walkers were waiting at The Dalesman, plus a couple and the capacity of the bus is strictly 16. 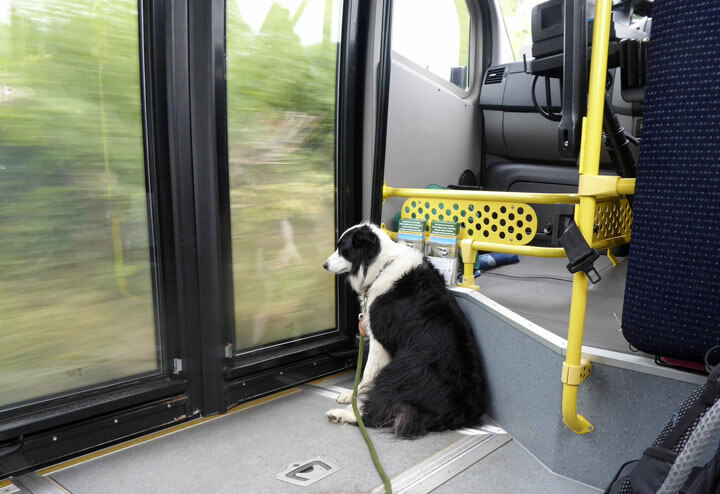 It transpires that there was already five others on the bus and so we left the stop full. (stop full full stop!). Now what would have happened if the numbers reached 17 and I was the only single? Furthermore I paid! Don't go there! There is a later bus. The driver was great and didn't mind Molly sitting at the front and looking out of the window. 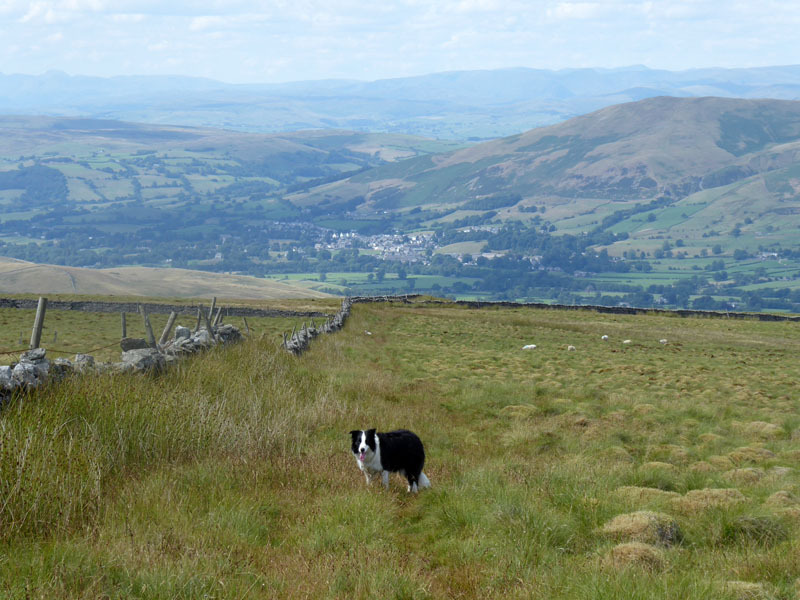 Two got off further into Sedbergh and one in Dent and nobody else wanted to get on - result! Time taken: 4hrs 30mins over a distance of about 9.5 miles. 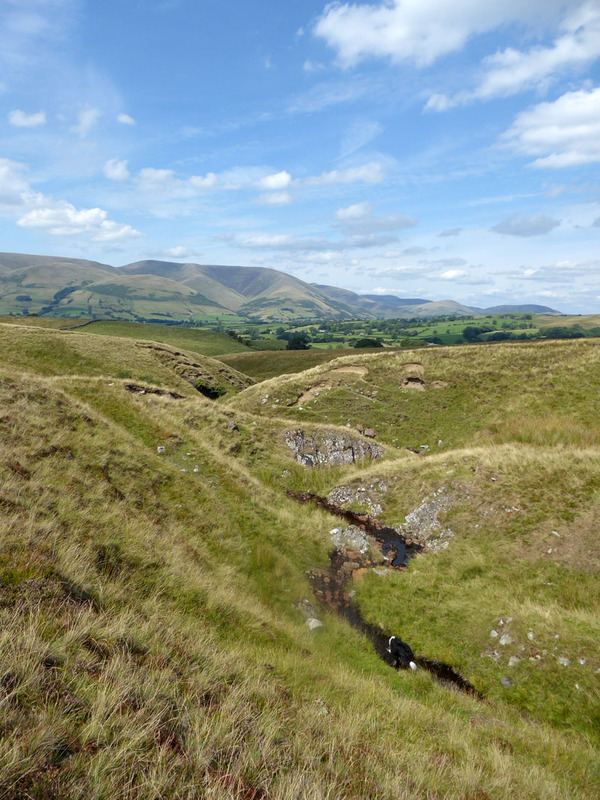 Route: Dent Station, Cowgill, Black Hill, Rise Hill, Aye Gill Pike, Holebeck Gill, High Hollins, New Bridge, river path to Sedbergh. 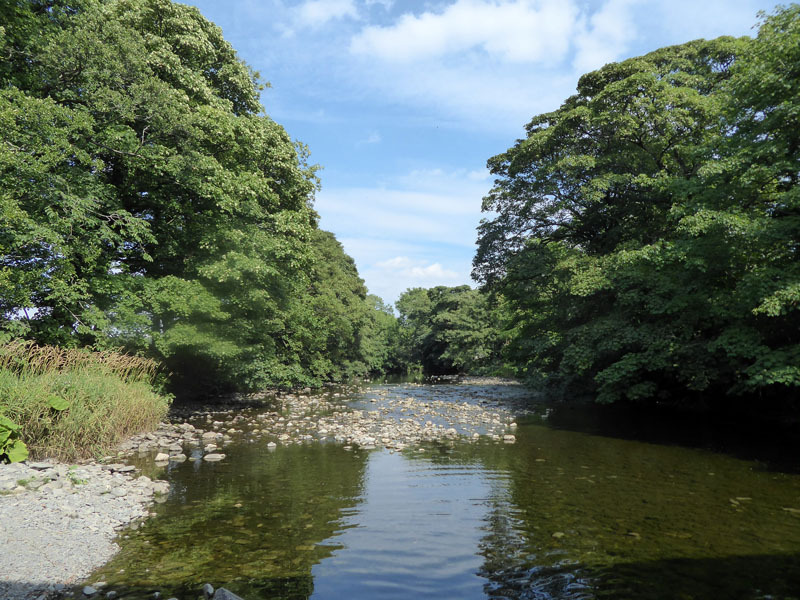 Weather and conditions: Hazy sunshine and warm. 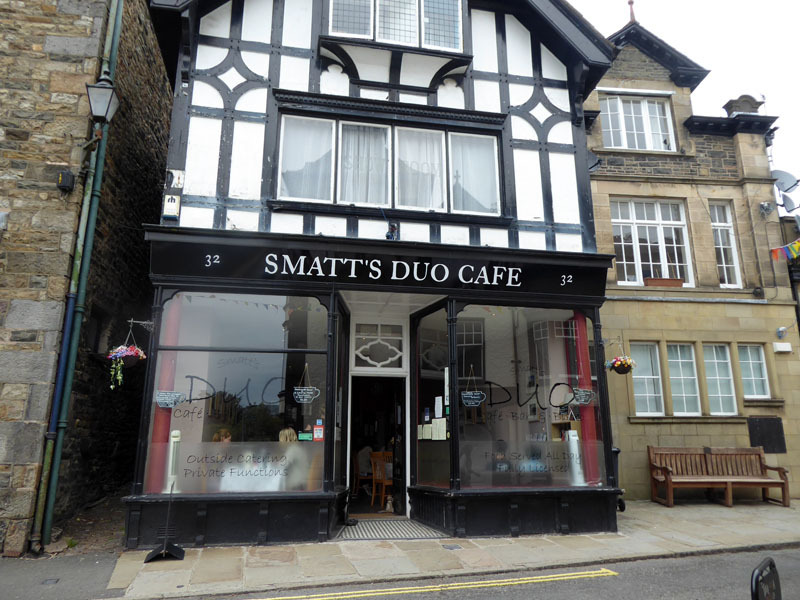 Refreshments: Smatt's Duo is very good.